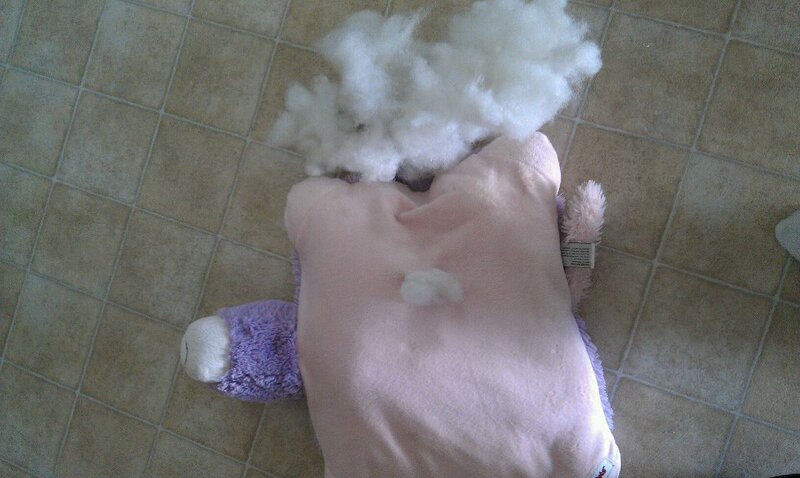 The Pillow Pet is dead. Don’t worry. His fur sitting in a pile beside him is NOT because of Natalie and her Death Clips. 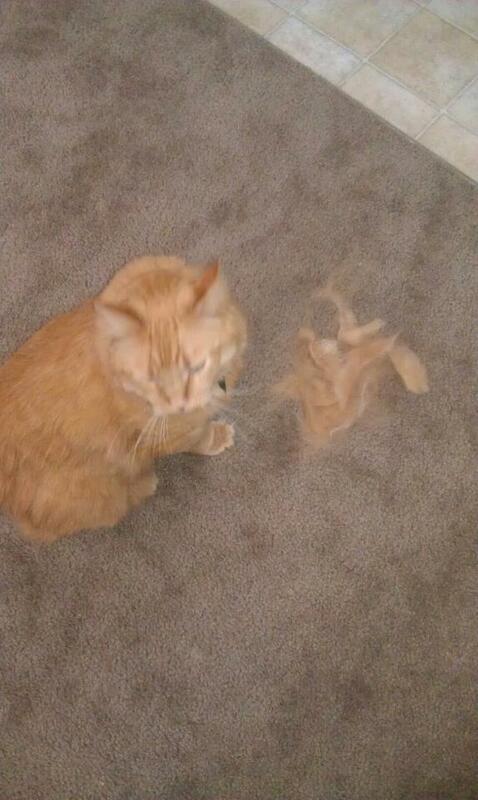 No, that came from brushing him. This is why our furniture seems to always be covered by a thing layer of orange cat fur. Fun. Anyway, I’ve hidden the scissors. Again. I keep doing this and Natalie keeps finding them. Or she’ll find a completely different pair because apparently our house craps out scissors. Now where is that Elf on the Shelf when I need him so he can report back to Santa on Natalie’s behavior? We don’t do Elf on the Shelf. I love the way kids "help" their stuffed toys. Maybe you need to duct tape that "Elf on the Shelf" to Natalie. Just saying! My 5 year old nephew has issues with scissors. His hair is always buzzed because when it grows longer, he always manages to cut out a chunk. My sister has no clue how this happens! Maybe Max tore it up. OMG, Natalie is just like Bella when it comes to scissors. Not sure if you ever read my post where Bella attacked her Barbie doll and hacked her hair so badly she looked like Kate Gosselin (before she grew her hair out). And then she tried to come after MY hair with the scissors. You might have to keep those scissors in a lock-box...in the basement...far away from her until she gets over her scissor-happy phrase. At least the scissors were not used on her hair! Poor Pillow Pet. That is sorta funny. Hide the scissors before she gets ahold of the cat! The pillow pet looks like the doggie bed Hubs spent waaaay too much for and the dog chewed it to smithereens in less than a day. Poor sweet Dr.Natalie, it sure does look like surgery gone bad. I saw the cat and knew it had had a 'trim'. Our daughter 'Social Butterfly' never cut her own hair but she did, in fact...trim the cat! Ya crack me up sweetie! Oh man, poor pillow pet! My friend's toddler grabbed a razor a few months ago and shaved his hair in the back. That's what I thought of when I saw the photo of your kitty. Thank goodness the hair loss was from brushing! 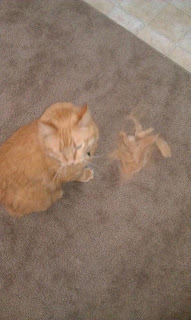 I have two kitties and I swear they shed like crazy even when I brush them frequently. Annoying. I am laughing out loud, I guess we were wrong about elf on the shelf. My kids have been great about scissors and markers. It's my niece that comes over and destroys things, GRRRRRR. Poor pillow pet but good news if you were at a loss what to get her for Christmas I'd say a new pillow pet! I love Natalie stories!!! Sorry, I know she gives you a run for your money but she is hysterical!!! Thank you for sharing her with us!! I'm writing about Elf on the Shelf and not doing it next week too. But I love the surgical explanation. Oh man! Poor unicorn! Is she upset by this in the slightest bit? At least she isn't too upset about the unicorn.. Good idea to hide the scissors though! I thought that she had cut the cat's fur and my eyes got wide, then I breathed a sigh on relief to find out it was from being brushed. Ya know those stories on the news where the parent falls over unconscious and the child calls 911 and saves the parent's life?